Social media have been controlling our method of communication indeed and I do space out a lot of times while contacting my friends. They usually got irritated and say Are you listening? Do you understand what I’m saying? 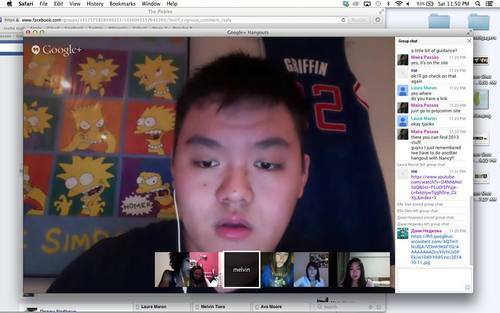 Other than Facebook, GoogleHangout have been influencing our method of communicating, we decided to explore a little bit more about the usefulness of it. This is how the idea of Digital Literacy Program came up. As we are getting more insights to Google+, we decided to create a circle in there. It is easier to share videos privately within a group (any size) by Google+. Therefore, we don’t have to publish them to youtube before sharing the link in our Facebook page. If you’re talking about ethics and respect, physical meeting is the answer. I personally do prefer face-to-face meeting if I have to discuss something with my group because it affects my level of productivity and motivation. If you’re talking about involving outer community, virtual communication it is. 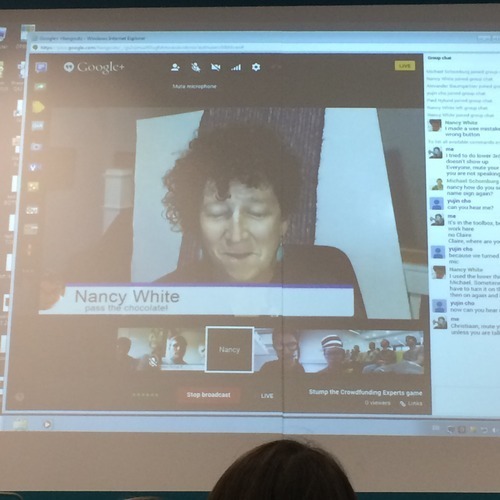 We have as well experience a hangout session with Nancy White during our class assembly. It have been a successful method of communication. But why do we suggest Digital Literacy Program if I, myself, do not like the idea of virtual conversation? Remember when you were a little kid, you were constantly taught to Listen to your teacher? If we analyze a deeper thought towards psychological factor, we see teacher as a respectful man/woman. So, students will not be distracted and they will pay attentively to listen during the lesson. This is how we think the program will most likely to succeed, as I have also show a proof of our virtual-conversation-with-a-teacher experience above. Since the program is focusing on getting volunteers, we contacted local universities who are willing to voluntarily teach these girls of PAGE. To link those technological tools with crowdsourcing as a method of marketing, we use Google+ as our platform for the program. In my own opinion, I think cultural differences do differentiate preferences of tools. However, this is not a big obstacle for a method of communication because even if you are new with (any tool), you will be able to get along and participate the conversation. And if some people are sticking to their preferences, we can always cooperate with them. After all, we as students are here to learn and as innovators/designers are here to listen to what our client needs.